Morocco, Indiana | October 16, 2016 - Newton County in northwestern Indiana has seen a lot in its day, and its history just got richer this weekend. Roughly 25,000 pounds richer. On Saturday, The Nature Conservancy introduced a herd of 23 bison to its Kankakee Sands prairie restoration project. The Nature Conservancy has an extensive bison conservation program, with herds now found on 13 preserves throughout the country. Kankakee Sands is the easternmost Conservancy preserve where the animals roam. Of course, everyone wants to know: Can we actually see the bison? The viewing experience, too, has been part of the planning. “Visitors will be able to see the bison easily and safely,” says Capizzo. A viewing area has been established just off U.S. Highway 41, which runs through Kankakee Sands. Its slight elevation will provide a natural “platform” where wildlife viewers should be able to see the bison grazing on the prairie. Historically, bison roamed the Indiana prairie, although likely in small herds in contrast to the huge herds on the Great Plains. Explorers and travelers reported seeing bison in the state in the 1600s and 1700s. In 1824, a traveler encountered a lone bison near the preserve’s location, and shot it. The animals were extirpated from the state by 1830. Native habitat hasn&apos;t fared much better in the state: More than 99 percent of Indiana’s prairies have been lost to agriculture, development and lack of prescribed fire. Since 1996, the Conservancy and partners have been working to restore a significant slice of prairie at Kankakee Sands. Nearly 6,500 acres have been planted with 600 native plants. Like its own “field of dreams,” once those plants were in the soil, the native wildlife followed. But planting prairie plants is just one part of restoration. The prairie evolved with grazers and fire. Conservancy stewards manage some of the preserve with patch-burn grazing, where cows follow areas burned with prescribed fire, mimicking natural prairie processes. Now bison will be added to the management plan. Want to learn more about the bison at Kankakee Sands, including where they came from and how they’ll help manage the prairie? The Nature Conservancy&apos;s Kankakee Sands is 10,000 acres of prairie and savanna habitat in Northwest Indiana and Northeast Illinois, open every day of the year for public enjoyment. The Nature Conservancy in an international, non-profit organization. 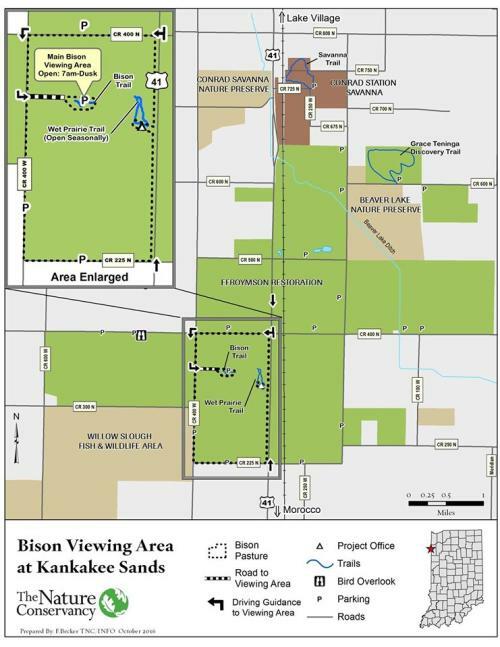 For more information about Kankakee Sands, visit www.nature.org/KankakeeSands or call the office at 219-285-2184.